Does My Dog Need A Slow Feeder Bowl? Does your dog morph into a canine version of The Flash when it’s feeding time? Do you ever worry your dog will choke because they seem to inhale, rather than chew, their food? Could your pup place gold in the speed-eating Olympics? Then your dog might benefit from a slow feeder bowl. These funky-looking contraptions are specifically engineered to do the seemingly impossible: slow down your dog’s eating. Why Should My Dog Use A Slow Feeder? Speed eaters often ingest air along with their food (aerophagia). The consequences of this can range from mild discomfort to fatality. Like in humans, swallowing excess air can lead to excess gas and stomach aches in pups. However, dogs have the unique risk of getting bloat. While bloat in humans may result in a temporary inability to squeeze into skinny jeans, the consequences for dogs are far more serious. Bloat (technically termed Gastric Dilation and Volvulus or GDV) is a fast-acting, life-threatening condition. This occurs when a dog’s stomach literally flips over, causing blockages to and from the stomach. Bloat typically results in a distended stomach, breathing issues, compromised blood flow, stomach rupture and other severe symptoms. Though experts are still mystified by the exact cause of bloat, it is known that excess air in the stomach (typically caused by overly quick eating) is a common culprit. The risk is even greater in larger breeds, deep-chested breeds, and dogs who exercise immediately after eating. However, no dog is immune to bloat. Therefore, slow feeder bowls can protect your dog from thunderous flatulence and serious ailments. Plus, they can save you from constant worry! In addition to the physical benefits, slow feeder bowls can make meals even more fun for your dog! I know what you’re thinking, “How on Earth could my cuisine-crazed canine enjoy feeding time more than she already does! ?” Well, slow feeders are like dog-friendly puzzles. They transform meals into rewarding games. Wild dogs have to use problem-solving to get their meals. Slow feeder bowls can ignite your pup’s instincts (yes, even your couch potato pug) to use problem-solving in eating. So, slow feeders stimulate your dog’s brain and taste buds simultaneously! How Do Slow Feeder Bowls Work? What is a slow feeder bowl? How can this contraption help my dog? Glad you asked! A slow feeder bowl is a feeding bowl designed with separations and obstructions so that your dog has to use more effort, precision, and time to complete their meal. It’s almost like a dog-friendly puzzle with the ultimate reward – food! Your dog has to take their time to scoop out food from every nook and cranny. Slow feeders come in a variety of shapes, designs, sizes, and materials. So there’s sure to be a slow feeder that’s a perfect match for your food-crazed Fido. What Are The Best Slow Feeders? There are a number of slow feeders on the market. It’s important to keep in mind material, difficulty, ease to clean, sturdiness, and size when picking the perfect feeder for your pup. For instance, consider whether you have enough time to hand-wash the bowl regularly or need a dishwasher-safe bowl, whether your dog is rough and likely to flip over a light-weight bowl, whether your dog has a snout too short to reach into deep grooves, and your dog’s chewing habits or dental issues when picking material. We’ve narrowed down slow feeder bowls that deserve two paws up! Outward Hound Fun Feeders are mega-popular for a reason! Their vibrant color assortment is for more than just aesthetic purposes. Each color version has a unique design that results in different levels of difficulty. The orange version’s spiral design is a maze of maximum difficulty. So, if your pup eats at an Olympic pace then this is the bowl for her! It’s also made of super sturdy material that can handle the roughest eaters. Plus, it’s top-rack dishwasher safe, so there’s no need to hand wash a slobber-and-kibble-covered bowl. Purchase Outward Hound Fun Feeder’s Orange Version here! The Ethical Pet Slow Feeder is another option with raving reviews! It features the classic spiral made design that has been proven to promote slower eating. This feeder is particular great for medium and large dogs since it has a non-skid bottom that keeps the bowl upright and in place. It’s also dishwasher safe, so cleaning it is a breeze! Purchase Ethical Pet Slow Feeder Dog Bowl here! Would your pup place silver or bronze in a speed-eating contest? Does your foodie Fido have a low frustration tolerance? Then Outward Hound Fun Feeder’s purple version may be the perfect fit! This slow feeder’s maze is slightly easier to solve than its orange counterpart. So, it’s great for dogs with moderately fast eating habits or pups who aren’t so keen with puzzles. Plus, the purple model is made of the same dishwasher-safe and durable material as the orange model. Purchase Outward Hound Fun Feeder’s Purple Version here! 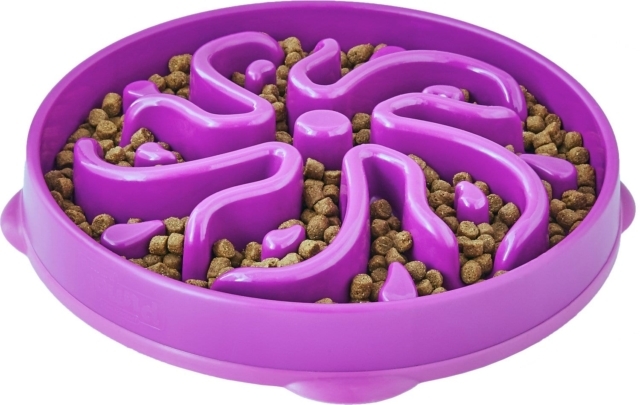 Are traditional slow feeder mazes no match for your dog’s lightning-fast eating? Then Northmate Green Interactive Dog Feeder might do the trick! This slow feeder’s grass-like design will ignite your dog’s foraging instincts, making it more intuitive than eating from a plastic enigma. With this unique feeder, your dog will scavenge for food using her tongue to push kibble through blades of “grass.” And, unlike real grass, this feeder is extra durable and dishwasher safe. Purchase Northmate Green Interactive Dog Feeder here! Can You DIY A Slow Feeder for Dogs? If you’re a Do-It-Yourself type, you’re in luck! Slowing your dog’s eating doesn’t necessarily require a fancy new feeder or a trip to the pet store. You can create your own contraption to promote slower eating habits. 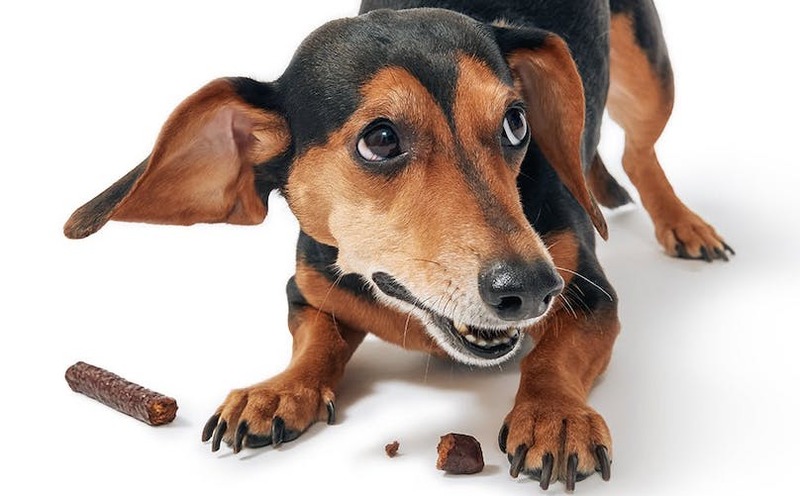 Promoting slower eating can reduce a number of health risks for your dog, ranging from stinky toots to severe stomach and intestinal conditions. While slowing your food-crazed Fido during feeding time seems like an impossibility, it doesn’t have to be! With these tips and suggestions, you can transform your dog’s eating pace from Hunger Games starvation to leisurely afternoon brunch.